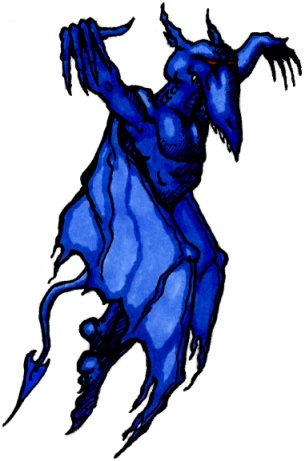 As a natural inhabitant of the Eighth and dungeons, these flying demons are considered to be pests by the Empire. Although they are one of the few dungeon creatures that can fly, they are unable to fly very well, sticking as low to the ground as possible to prevent strong air currents from throwing them about. Wraithwings are rather large creatures, and while they have very strong leg muscles, their forearms are very weak, meaning that extensive flapping is required to keep them even remotely above ground. Outside of dungeons, wraithwings tend to live in expansive and deserted lowlands, which allow them to live in solitude. This makes a good habitat until the floods hit in the summer, which cause them to migrate into dungeons. Because of the strong leg muscles, they can cross deep chasms that many other monsters are unable to cross. Wraithwings are smart, and use strength in numbers. A solitary wraithwing is a coward, and will run away from a smitemaster until they hit an obstacle. As a group of two or more, they will advance toward the smitemaster. As wraithwings are flying monsters, they can traverse water and pits. They do not activate pressure plates and are unaffected by hot tiles but can be killed by briars. The movement pattern of wraithwings is one of the most complex, as its movement depends on how far it is from the player, and also takes into account the other wraithwings in the room. Wraithwings calculate distance by taking the maximum of horizontal and vertical distance. On a wraithwing's turn, it first calculates the distance from itself to the player: X. If X is more than 5, it will move closer to the player like a roach. distance from the player (using the same rules): Y, and that wraithwing's distance from itself: Z. If for some other wraithwing, the absolute value of (X-Y) is less than 3 and Z is more than 2, it will attack the player like a roach. In other words, it will attack if there's another wraithwing that's roughly equidistant from the player, but not too close to the wraithwing itself. Otherwise, if X is 5 exactly it will freeze, and if X is less than 5 it will flee like a roach queen. This scenario is complicated by the fact that, as we know, the wraithwings move according to their movement order, and so these variables will change for each wraithwing, each time its nearby wraithwings make a move. Wraithwings use similar rules when brained as unbrained. If the wraithwing calculates itself to be more than five squares from the player (that is, if X is at least five), the wraithwing will attack like a brained roach. If the X is five or less, it will do a search for other wraithwings as before. If it decides to attack, it attacks like a brained roach, and if it decides to flee, it flees like a brained roach queen, except without the diagonal movement toward the center of the room.